Today stocking stuffer gift idea for the bicyclist on your holiday shopping list is the coolest thing in multi-function headwear! Changing weather conditions call for adaptable accessories, and the Endura Multitube is a virtual cycling chameleon. This fast-wicking stretch tube gives you endless possibilities for neck and face coverage as well as head coverage under a helmet. 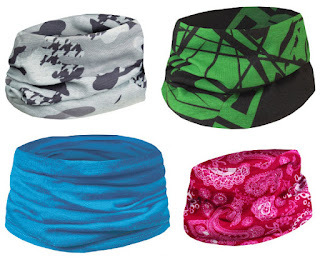 Wear it as a neck warmer, face mask, bandanna, or skullcap. Only $17.50 each, and available in a wide array of colors and patterns in the regular Endura Multitube or Endura MTB Multitube versions. Also available in warm, cozy merino wool with the Endura BaaBaa Merino Tech Multitube ($27.50 each). See our full selection of accessories from Endura, Pearl Izumi, 45NRTH, and Giro! Don't forget that you can get an even better deal on these and any clothing and accessories with our "Oh What Fun It Is To Ride" Holiday Sale!